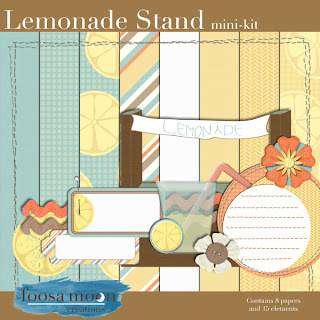 Yesterday I posted the preview of my mini-kit, Lemonade Stand. I spent a little time during nap time later in the day to put together a page with the kit. Working with the kit was a lot of fun. I pulled some of my favorite pieces to work with, and was able to tell about Maggie's summer plans (ALL of them) in one simple page. Lemonade Stand is available as a freebie, either by visiting the gallery at Digi Scrap Connect, where the Design Factor challenge is being hosted, but I am also going to be putting the links here today too! So you don't have to go anywhere extra if you don't want. Thanks for visiting, and I'd love to see what you do with Lemonade Stand. If you use the mini, please leave a comment (with a link if possible). Thank you so much for this post. 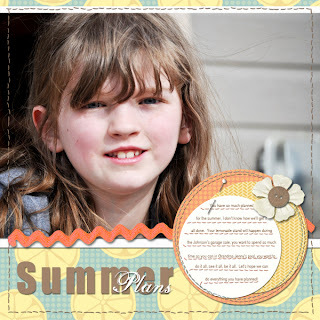 I want to let you know that I posted a link to your blog in CBH Digital Scrapbooking Freebies, under the Page 2 post on Aug. 08, 2011. Thanks again.